Once upon a time, there was a very naughty monkey who one day decided to travel to a tropical forest, really far away from home. He took ten bananas before leaving and then began his journey to the forest. He walked and walked until he was so exhausted that he decided to rest in a very high tree. After recovering his energy, he continued his journey. Later, he realized that he had no more food. In addition he was very thirsty and he still did’nt even know where the tropical forest was. – “Yes please!” – said the happy monkey. 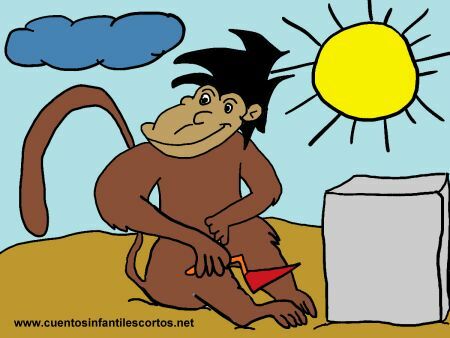 When he arrived, his parents and siblings welcomed him happily, and gave him food and drink, and he realized that it was time to mature and stop being a naughty monkey. Moral of the story: Don´t be naughty.